Understanding Earth’s climate involves observation, analysis, peer-review, publication, and collaboration. For climate modeler Lisa Sloan and paleobotanist Scott Wing, collaboration also involved tears, a dartboard, and a rattlesnake beheading. It may sound unconventional, but their collaboration has shed light on one of the warmest—and most puzzling—periods from our planet’s past. Around 56 million years ago, Earth’s temperatures spiked. That period of time is known as the Paleocene-Eocene Thermal Maximum, or PETM for short. It was one of the warmest periods in Earth history. Global temperatures likely rose by 9 to 14°F (5 to 8°C) for thousands of years. Geologists and paleontologists have known about the high temperatures for decades, but questions remain. How did the spike affect life on Earth? Could it happen again? Growing up in Pittsburgh, Lisa Sloan paid regular visits to the Carnegie Museum of Natural History. Looking at scenes of cavemen and other prehistoric life, she knew what she wanted to do when she grew up: make dioramas. Left: Modeled climate for the PETM, adapted from Sloan's 1990 paper in Geology. Right: Lisa Sloan, photo courtesy University of California, Santa Cruz. Bringing her cat along for overnight stints in the computer lab, Sloan keyed every line of that inch-and-a-half-thick DARPA book’s code into the university computer. “Computing was so primitive then, it was like taking a butter knife to surgery.” Even so, she had found her career. Soon after, one of her professors suggested they work together on a literal hot topic: the Eocene Epoch. In 1990, they submitted their paper for publication, with Sloan as the lead author. “Geology was, and still is, the premier publication for papers like this. I didn’t even have a Ph.D. yet, but I got this paper published in Geology.” It was June 1990, she recalls, and she was on top of the world. Scott Wing grew up in North Carolina, and like Sloan, he spent his childhood fascinated by our planet’s past. When he had free time in high school, he signed up for a college-level course at Duke University on human evolution. Impressed by the high school student, the professor suggested that Wing try some hands-on paleontological fieldwork. With his professor’s letter of introduction, Wing finally found someone willing to let a 17-year-old fossil hunter tag along, and in the summer of 1972, he spent several weeks digging fossils in Wyoming. 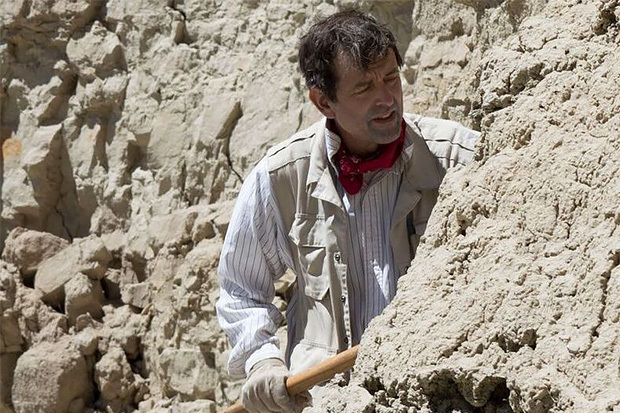 Wing excavates fossils in Wyoming every summer. Photo courtesy Scott Wing. Wing studies the rapid spread and diversification of flowering plants that occurred from the late Cretaceous Period through the Eocene Epoch, roughly 70 million to 50 million years ago. Wyoming, where he digs fossils yearly, was home to palm trees and crocodiles around that time. In fact, so was the Arctic. By the time he read Sloan’s paper in Geology, Wing was an established scientist at the Smithsonian Institution. He knew his fossil plants. And he knew her paper had to be wrong. In his rebuttal, Wing quoted the caveat, then wrote, “Such data already exist in the paleontological literature,” He included a table of specific examples. Borealosuchus wilsoni, a fossil crocodile collected from the Green River Formation in southwestern Wyoming, is an example of warmer conditions in North America during the Eocene Epoch. This specimen is now on display in the Field Museum of Natural History, Chicago. Photo by Flickr user James St. John. Sloan went from elation at publishing a paper in a prestigious journal before she completed her Ph.D. to wondering if her career was over before she completed her Ph.D. “I cried my eyes out for days,” she admits. A buddy wrote a fake response to Wing’s rebuttal—presumably something unprintable in the peer-reviewed literature—and suggested she mount Wing’s paper on a dartboard. She took his advice. Geology published Wing’s rebuttal and Sloan’s response to it in May 1991. In October of that year, Sloan attended the Geological Society of America’s annual meeting, in San Diego. At lunch one day with a couple colleagues, she found herself sitting across the table from Wing. “We jousted a bit,” Sloan says. But to her amazement, she realized she didn’t actually hate him after meeting him in person. 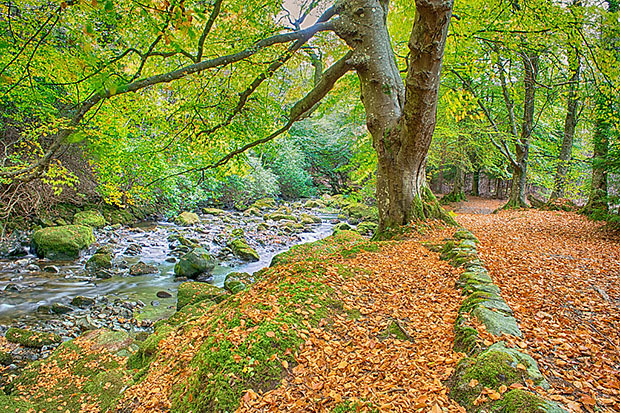 Plants near rivers and lakes can drop their leaves into the water where rapid burial might preserve those leaves in the fossil record. Photo by Flickr user Matt Dean. 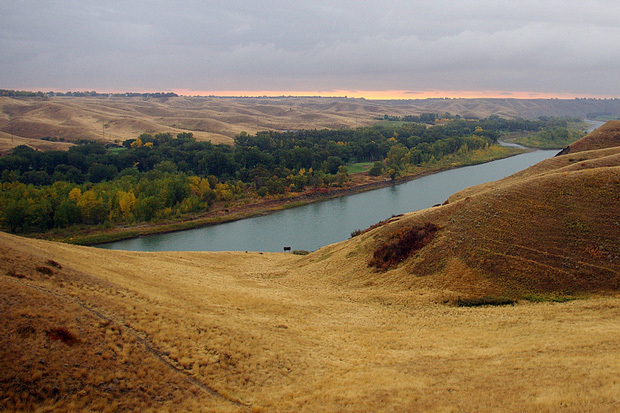 Trees commonly line rivers, but a short distance away, plant life may be completely different—and unlikely to leave any fossils. So, although fossils provide glimpses of ancient climates and landscapes, they don’t provide a complete picture. Climate models can fill in the gaps left by Earth’s incomplete fossil record. Photo from Wikimedia Commons. Higher carbon dioxide concentrations and a big lake system did the trick. Modeled temperatures in North America and Siberia were higher than in her 1990 simulation, and consistent with the abundance of warm-climate fossils from the PETM. “That’s one of my favorite papers ever,” she says. While Wing was on sabbatical, Sloan joined his crew for fieldwork at Polecat Bench, Wyoming. 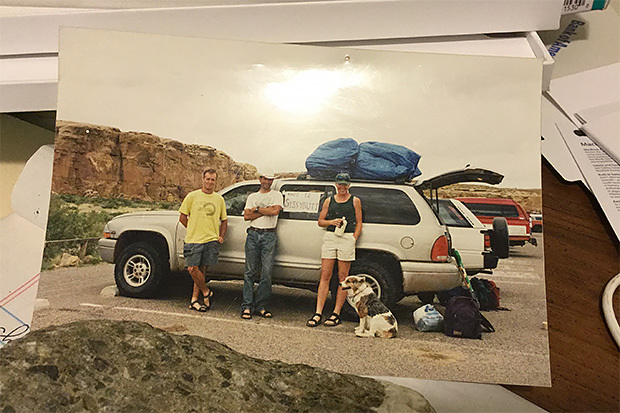 Here, Wing stands in front of the newly christened expedition vehicle, in between a grad student (left) and a local rancher (right) and the rancher’s excellent field dog, Pepper (far right). Despite having to help push their subpar SUV out of a dry wash at one point, Sloan still has fond memories of the fossil dig. Photo courtesy Lisa Sloan. Sloan once joined Wing and his students for fieldwork at Polecat Bench, Wyoming . Field conditions in the Bighorn Basin were primitive. Participants had their own sleeping tents, and each morning, everybody gathered around the cook tent. There was no shower, and toilet facilities consisted of a shovel for digging oneself a deeply personal hole. But what Sloan remembers most was the snake. “One morning, somebody heard a rattlesnake,” Sloan recalls. “Everybody looked at Scott. He nodded, picked up the shovel and Whack!” Wing beheaded the rattlesnake with a single shovel blow. Models used to simulate ancient climates have improved since 1990, offering better spatial resolution and a much better fit with the fossil evidence. It’s pretty clear, says Wing, that a spike in greenhouse gases during the PETM caused the spike in global temperatures, but the precise combination of gases—carbon dioxide, methane, water vapor—is still under debate. Wing thinks that the source was mostly carbon dioxide. He suspects that some came from volcanoes, and some from organic carbon. Sloan seconds volcanoes, but adds the possibility of methane released from shallow, icy sediments as seas warmed. 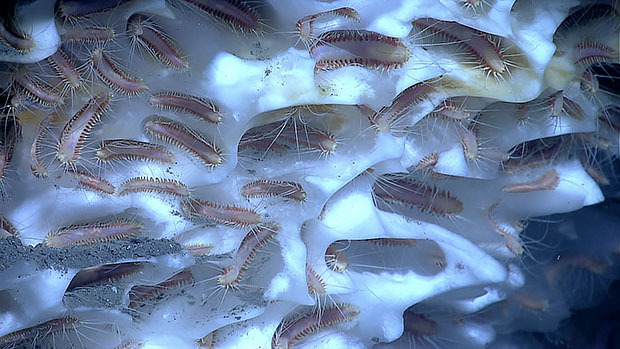 A frozen methane clathrate serves as a small apartment complex for methane ice worms. Thawing clathrates produce a potent greenhouse gas. Photo by Flickr user NOAA Photo Library. Whatever the exact sequence of events that led to the PETM warming, the fossil record documents big impacts to plants and animals. Ocean acidification hampered shell building, and roughly half of the foraminifera living on the bottom of the deep sea went extinct. In places like Wyoming, the dramatic temperature changes wiped out some plant populations, and some mammal species turned puny. Plants suffered in other ways. Leaf fossils from the PETM show increased insect damage. This might be down to the fact that lots of bugs like heat. It might also be down to the fact that higher carbon dioxide levels can spur plant growth, but the faster-growing plants are often less nutritious. The average bug probably had to eat more to survive. 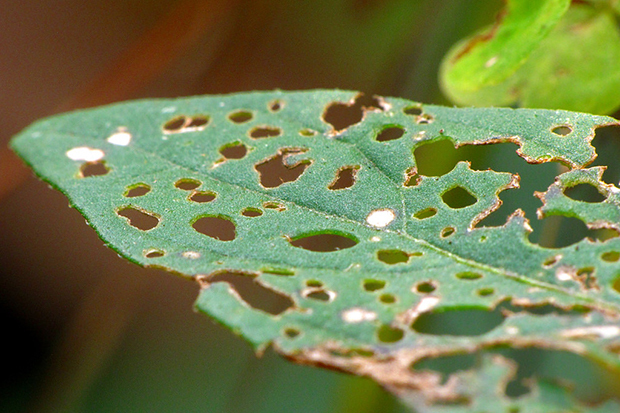 Leaves have been on insect menus for millions of years. Photo by Flickr user Sandy Sarsfield. 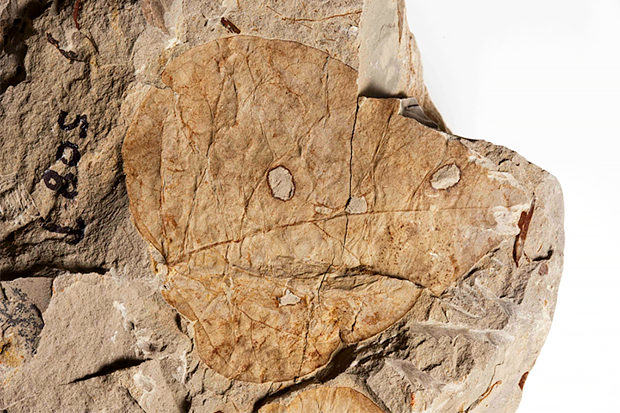 Fossils frequently preserve insect damage to leaves, including this specimen from the Paleocene-Eocene Thermal Maximum. Photo courtesy Scott Wing. 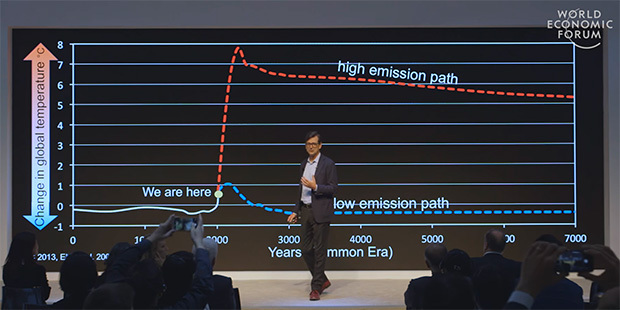 In a talk he gave at the World Economic Forum in 2016, Wing explained that the PETM likely resulted from the release of about 5,000 billion tons of carbon over several thousand years. That’s about the amount of carbon that we will release if we burn Earth’s entire reservoir of fossil fuels. Humans haven’t burned the entire reservoir yet, but we are going through it at a much faster rate than anything that happened 56 million years ago. “This is like the PETM on steroids,” he told the audience. Then he pointed out something even more sobering about the PETM: The warming lasted for about 150,000 years. Wing discusses the lingering effects to greenhouse gas emissions at the World Economic Forum. Screen capture from YouTube. Archibald, J.D., Wing, S.L. (1991). Comment: “Equable” climates during Earth history? Geology, 19(5):539-540. Bowen, G.J., Bralower, T.J., Dickens, G.R., Kelly, D.C., Koch, P.L., Kump, L.R., Meng, J., Sloan, L.C., Thomas, E., Wing, S.L., Zachos, J.C. (2006). Eocene hyperthermal event offers insight into greenhouse warming. EOS, 87(17), 165. Gingerich, P.D. (2003). Mammalian responses to climate change at the Paleocene-Eocene boundary: Polecat Bench record in the northern Bighorn Basin, Wyoming. Geological Society of America Special Paper 369. Sewall, J.C., Sloan, L.C., Huber, M., Wing, C. (2000). Climate sensitivity to changes in land surface characteristics. Global and Planetary Change, 26, 445-465. Sloan, L.C. (1994). Equable climates during the early Eocene: Significance of regional paleogeography for North American climate. Geology, 22, 881-884. Sloan, L.C., Barron E.J. (1990). “Equable” climates during Earth history? Geology, 18, 489-492. Sloan, L.C., Barron E.J. (1991). Reply: “Equable” climates during Earth history? Geology, 19(5): 540-542. Wing, S.L., Harrington, G.J., Smith, F.A., Bloch, J.I., Boyer, D.M., Freeman, K.H. (2005). Transient floral change and rapid global warming at the Paleocene-Eocene boundary. Science, 310, 993-996. 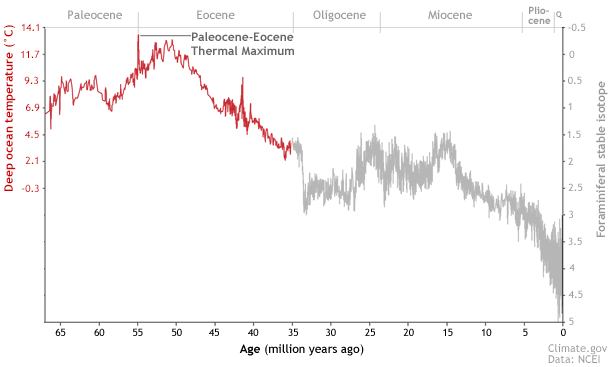 The Paleocene-Eocene Thermal Maximum (PETM) ranks among the hottest periods in Earth’s history. Global temperatures likely rose by 9 to 14°F (5 to 8°C). Two scientists—a climate modeler and a paleobotanist—forged an unlikely friendship after they were initially at odds over how warm the PETM really was. Over the years, the two used the fossil record to cross-check model predictions, and used models to describe climate in places where the fossil record is sparse. Their research on the PETM may provide clues to what Earth will be like if we wind up burning all known fossil fuels.